Senior Alex Iglinski, shown above in a checkered suit, captivates the audience with his dynamic stage presence. 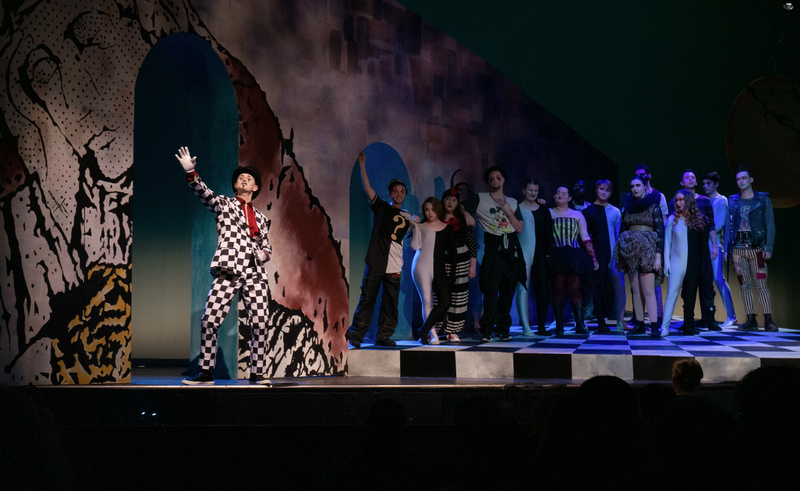 This weekend, the Lawrence University Department of Theatre Arts presented “Pippin” on Thursday, Friday and Saturday to students and the public community. With a trippy, disorienting musical set, impressive costumes and wonderful performances by the cast, LU’s “Pippin” was a stunning performance. The show was originally conceived by Carnegie Mellon University’s acting troupe “Scotch’n’Soda” as a short, and Scotch’n’Soda alum Stephen Schwartz went on to develop the musical and write the music and lyrics. It was first directed on Broadway by Bob Fosse, and a book by Roger O. Hirson was also produced. There have been many adaptations and changes in the play throughout the years, one being the ending. The LU version of “Pippin” utilizes the “Theo ending.” Having personally never seen this show before, the only thing I knew going in was that it was my mom’s favorite show of all time; I had no idea what to expect. It was definitely my kind of musical — engaging, humorous and catchy, but also profound. The show consists of two acts, each with a number of named scenes which are visually introduced by the players. The alluring Leading Player, played gracefully by senior Alex Iglinksi, constantly breaks the performance barriers between the stage and the audience. The troupe, which carries the performance through, interacts with the characters as well as the audience. It is a bit of a play within a play, with Pippin and the other characters being the actors and the Leading Player and the troupe introducing and producing the play. These non-traditional musical elements are accompanied by costumes from a variety of decades and styles. Costume Design Professor Karin Kopischke beautifully blended middle ages with punk rock, and the set design led by Visiting Assistant Professor of Theatre Arts Maureen Chavez-Kruger makes the audience feel like they’re in a psychedelic castle of some sorts. Senior Sam Taylor’s portrayal of Pippin seemed to be the perfect fit, and he was undoubtedly one of the audience’s favorite characters. He incorporated just the right amount of existential confusion, Charlie Brown-esque self-deprecation and cockiness. Not to mention his various solos and dancing, which were done beautifully. I was thoroughly impressed with all the song performances. The troupe’s musical numbers were impressive and fun to watch. The humor was balanced with a heartfelt journey to find meaning in life, a love story and a pretty dark ending which I won’t spoil. I left the performance with all the songs stuck in my head and plenty of admiration for the theatre department.